Sunday Quote!- Ancient Apologetics and the Disinterest of the Modern Age | J.W. Wartick -"Always Have a Reason"
Thus, according to the editors of this volume, the “only” reason that anyone would be interested in these works in the modern era is because they wish to explore the cultural understanding of the religious traditions in Ancient Rome. That makes me quite sad, to be honest! 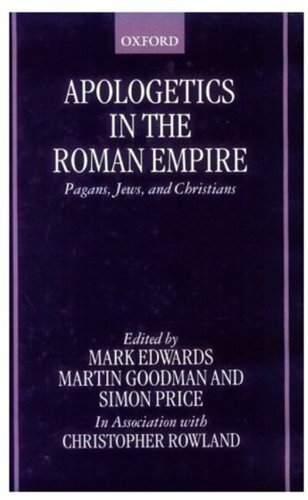 As one who is deeply interested in the study of historical apologetics, it seems clear that much of what is discussed in this volume is actually of interest to modern apologists, those interested in church history, and many others. Of course the editors are perhaps merely speaking only of the interest which they have found for their subject, which speaks of the sorry state of how we modern apologists have abandoned our historic roots. Perhaps these words can serve as a rallying cry to raise us from our stupor of historical ignorance and realize the vast, untapped wealth of historical apologetics. I have written to that end in a post in which I discuss the lost defenses of Christianity. Explore, take, and read! The book itself has much appeal for those interested in historical apologetics. I’m about halfway through right now and have found it to be quite excellent. « Really Recommended Posts 10/24/14- Reconciling in Christ, Walking Dead, and more! Thanks J.W. for this review. What a sad assessment that book made! I think another stream of interests I would like to explore more sometime (when I have the time) is the relationship of the early apologist to Judaism; in particular, Justin Martyr.